Founded as the Hebrew Immigrant Aid Society in 1881 to assist Jews fleeing pogroms in Russia and Eastern Europe, HIAS has touched the life of nearly every Jewish family in America and now welcomes all who have fled persecution. 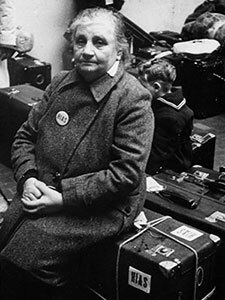 From our beginnings in a storefront on the Lower East Side of Manhattan, a group of American Jews organized to provide much-needed comfort and aid to thousands of Jews fleeing waves of anti-Semitic riots. While those who arrived were refugees – people who were being killed in their homelands because of who they were – the world did not yet have a legal concept for people who needed safe refuge outside their homelands. In New York City, the once tiny Russian Jewish population swelled by the thousands. They formed the Hebrew Immigrant Aid Society to provide meals, transportation and jobs for the new arrivals to Manhattan. A shelter was established on the Lower East Side providing dormitory space, a soup kitchen and clothing to any needy Jew. HIAS established a bureau on Ellis Island in 1904 providing translation services, guiding immigrants through medical screenings, arguing before the Boards of Special Enquiry to prevent deportations, and obtaining bonds to guarantee employable status. We lent some the $25 landing fee and sold railroad tickets at reduced rates to those headed for other cities. We even installed a kosher kitchen, which provided more than half a million meals to new arrivals on Ellis Island. HIAS also found relatives of detained immigrants. Six hundred immigrants were detained during just one month in 1917 because they had neither money nor friends to claim them. HIAS was able to locate relatives for the vast majority who were then released from Ellis Island. We became famous worldwide - and in many languages - as HIAS, the abbreviation that was our first cable address. In 1921, HIAS bought the former Astor Library on Lafayette Street in Manhattan to serve as a shelter providing housing, kosher kitchens, a small synagogue, classrooms for job training and civics education, a playground, and a weekly bazaar for the thousands of immigrants who passed through the doors each year. In the 1920s laws changed to recognize the need for safe haven but countries like the United States established legal requirements for resettlement. 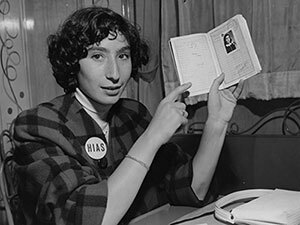 HIAS expanded to ensure that Jewish refugees could find welcome and safety. The outbreak of World War I brought the largest influx of Jews from Eastern Europe yet; more than 138,000 in that year alone. But soon after, restrictions limited the number of immigrants allowed into America to no more than 2 percent of the total of each nationality residing in the U.S. in 1890, severely restricting the entry of Jews from Eastern Europe. Though precious few refugees were rescued during World War II, due to the restrictive National Origins Quota of 1924, HIAS provided immigration and refugee services to those who were. It was not until 1965, through the aggressive work of HIAS, that the National Origins Quota was replaced with a new law, liberalizing decades of restrictive admissions policies. After the war, we were instrumental in evacuating the displaced persons camps in Europe and aiding in the resettlement of some 150,000 people to 330 communities in the U.S., as well as Canada, Australia, and South America. In 1948, Israel is established as the Jewish homeland. The Universal Declaration of Human Rights, as well as the 1951 Refugee Convention became the basis for U.S. asylum law, giving HIAS the basis for all future work to assist refugees no matter where they were. 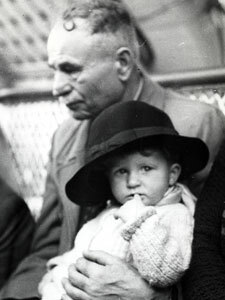 1956 - HIAS assisted Jews fleeing the Soviet invasion of Hungary and evacuated the Jewish community of Egypt after their expulsion during the Sinai Campaign. 1959 - HIAS set up operations in Miami to rescue the Jews fleeing Cuba’s revolution. 1960s - HIAS rescued Jews from Algeria and Libya and arranged with Morocco's King Hassan for the migration of his country's huge Jewish community. 1968 - HIAS came to the aid of Czechoslovakia's Jews after the suppression of "Prague Spring" and to Poland's Jews after pogroms racked that country. 1975 - Following the fall of Saigon, the State Department requested HIAS’ assistance with the resettlement of Vietnamese, Cambodians, and Laotians. That year, HIAS found new homes for 3,600 in 150 communities in 38 states. While not the first time HIAS had assisted in the resettlement of non-Jews, the organization’s assistance with this large-scale refugee crisis garnered a special thank you from President Gerald Ford. 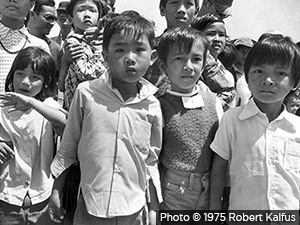 HIAS continued to assist refugees from Southeast Asia through 1979. 1977 - HIAS helped evacuate the Jews of Ethiopia, which culminated in several dramatic airlifts to Israel. 1979 - The overthrow of the Shah precipitated a slow but steady trickle of Jews escaping the oppressive theocracy of Iran. HIAS helped hundreds of Iranian Jews with close family living in the U.S. resettle here. In 2001, HIAS celebrated our 120th anniversary with a "HIAS Day" festival in Brighton Beach, Brooklyn. Two days after the joyful celebration, Al-Qaeda terrorists attacked America, throwing the entire U.S. immigration system into turmoil. HIAS mobilized its network to continue serving refugees, despite extreme delays in the arrival process brought on by increased security measures and the reorganization of the Immigration and Naturalization Service into the Department of Homeland Security. Because we have helped more than 4.5 million people escape persecution, HIAS is uniquely qualified to address the modern refugee situation, which has mushroomed into a global humanitarian crisis. We understand better than anyone that hatred, bigotry, and xenophobia must be expressly prohibited in domestic and international law and that the right of persecuted people to seek and enjoy refugee status must be maintained. And because the right to refuge is a universal human right, HIAS is now dedicated to providing welcome, safety, and freedom to refugees of all faiths and ethnicities from all over the world. 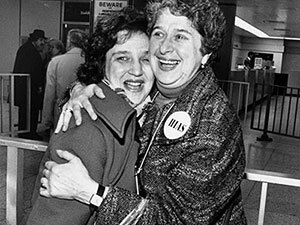 Starting in the 2000s, HIAS expanded our resettlement work to include assistance to non-Jewish refugees, meaning we became involved in the aftermath of conflicts from Afghanistan, Bosnia, Bulgaria, Czechoslovakia, Ethiopia, Haiti, Hungary, Iran, Morocco, Poland, Romania, Tunisia, Vietnam, and the successor states to the former Soviet Union. We began to work in countries where refugees fled to identify those in immediate danger to bring them to safety. We realized that there were many refugees who would not be resettled and that it was important for us to help. We began a new chapter in 2002 when we established operations in Kenya to provide protection to refugees from several African countries plagued by conflict, to advocate on their behalf, and to resettle the most vulnerable. This was the beginning of HIAS’ work to build safe communities for refugees in the countries of first refuge where the majority now remain indefinitely. HIAS recently celebrated 130 years of helping refugees escape persecution and resettle in safety; reuniting families who have been separated; and helping them build new lives in safety and freedom. HIAS continues to resettle the most vulnerable refugees of all faiths and ethnicities from all over the world. We facilitate the application process for the most vulnerable refugees who can be resettled in countries around the world. In the U.S. we work with local social service organizations around the country to welcome refugees and help them integrate into their communities and build new lives. 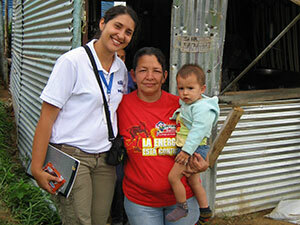 Finally, we continue to be on the front lines, working with refugees in camps and cities from Kenya to Ecuador. We are the only global Jewish organization whose mission is to assist refugees wherever they are. The HIAS archives, dating from 1909, chronicle the modern history of a people who have migrated around the world for centuries. Our archives contain records that may be of interest to you because they are a testament to your family's endurance, or you may need documents for more practical reasons.